Next Thursday April 26th at 6 PM at the Eritrean Association of Greater Seattle, EEC, CIRCC, and the Racial Equity Team will be hosting our second ever Lunch (in this case dinner!) and Learn: Have a Bite, Learn Civil Rights. 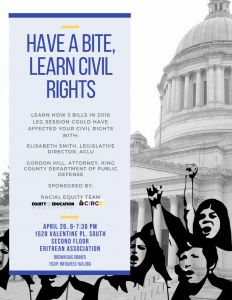 We will be hearing from the ACLU and King County Department of Public Defense on three bills in the 2018 legislative session that the RET opposed: one on collecting data on DNA; another on how teen’s sexting could lead to a sexual harassment charge; and the last on pretrial release decisions. We want to invite our community to attend this event so that we’re all aware of the bills that could negatively affect our communities and our kids.